Part of the LabLynx, Inc. Informatics Platform is the Development Platform, called sciForge, offered as a Platform as a Service (PaaS). Project Management - Managing implementation - and, later, maintenance, additional customization, etc. 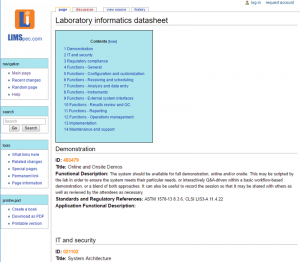 One of the earliest free resources for the laboratory, informatics, medical and scientific community's use after LabLynx established the Laboratory Informatics Institute in 2006 was the LIMSpec. The LIMSpec was - and continues to be - a standardized set of individual requirements that labs can select from to create their own URS (User Requirements Specifications) for informatics systems. It includes real-world specs in every category of laboratory data management functions, as well as sections aimed specifically at particular types of labs, e.g. environmental, diagnostic, etc. These were all derived from actual URSs, with some added by LIMSinstitute staff based on experience with labs in the industry. The LIMSpec has grown and evolved since its initial introduction, with today's emphasis being on clear, unambiguous language and open-ended opportunities for vendors to describe fully how they address each requirement. It attempts to steer away from excessive requirements for their own sake, in favor of actual meaningful and relevant functionality that truly reflects the lab's needs and preferences. The LIMSpec is your LabLynx community tool for the first step in the LIMS or other data management system lifecycle. The second phase of the LIMS lifecycle is implementation, and, after validation, then regular maintenance plus any future modifications. The LabLynx Project Management tool in the sciForge suite provides a complete system for management and documentation of all work, covering these areas. It includes an integrated online Help Desk ticket management system where customers can submit new tickets, manage existing ones and communicate with support staff, project managers and developers involved. It also provides for instant email notifications based on a variety of circumstances. Users can be notified of all updates to all or specific tickets, support can be instantly notified of new tickets and updates, etc. There are other features of this sciForge tool, including the ability to store and access documents, such as SOWs, contracts, etc., as well as uploading files (e.g. screenshots) to accompany tickets. There is a calendar showing task dates/deadlines, a progress chart and more included in the Project Management Help Desk. An online tutorial video and user guide are available on the LabLynx site at http://www.lablynx.com/company/help-desk. Use the LIMSpec to totally ease the validation process, by creating test scripts based on each requirement and the responses provided by LabLynx or the sciCloud.net® app provider. In addition, most general functionality is fully documented, complete with step-by-step instructions with screenshots and often video, for webLIMS and other apps, in online manuals and video tutorials. Your job is simple, with most of it already written, so that you need only present the information in step-by-step format necessary to demonstrate each feature or function. Results are documented in the LIMSpec-derived test scripts. Time spent, along with the completed scripts themselves, are stored in the LabLynx Project Management system, where they can be accessed any time there is a standards validation or certification audit. LabLynx even provides validation script templates, including DQ, IQ, OQ, PQ and more as necessary. 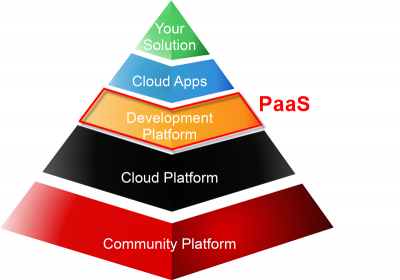 Of course when talking development platform, the first thing that comes to mind is tools for customization and configuration. As a general rule, the term "configuration" refers to making changes to an existing app without the need to write code, and "customization" refers to source code based work, including creating apps as well as modifying existing ones. LabLynx provides its iStudio screen designer tool through the sciForge development platform so you can work with your webLIMS solution at a developer level. System ERDs are provided, along with documentation to help you use the LIMStudio development tool. And our support team are always ready to help you with whatever you need. SciForge includes the Mirth app to help you integrate your system. WebLIMS will integrate with any other system, device or database using EDDs or file transfer, using the front end of the app itself users can map parameters (analytes) between instruments and the LIMS. But your sciForge Mirth integration tool allows you to create and manage the channels you need, talk to databases, web services and ftp services, automate file transfers and more, for webLIMS and generally, for other apps. For serial interfaces and other complex integrations, the LabLynx LabVia tool provides the necessary functionality, including connecting with Mirth channels. Mirth channels allow for either unidirectional or bidirectional interfacing, with the ability to have a great deal of control over specifics of the interface. 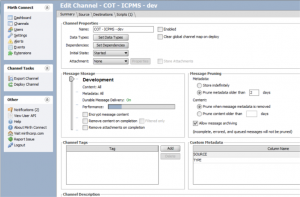 Once channels are defined, they may be used for the same purpose for future interfaces. At the end of the day, the only reason labs even exist is to produce results. If results could be produced without testing, then labs would go away, because it's the data that are important. So it follows that presenting data is a crucial part of any lab. The SciForge PaaS development platform includes a dedicated Report Builder, so you can present data in the format you need. Several default report templates are included with webLIMS, and they can all be modified and/or new ones created using the LabLynx Report Builder, provided with every LabLynx LIMS solution package at no extra cost. Fields, database objects, labels and much more are easily arranged, along with a header and footer and any number of groupings. Barcodes may be also added in the same drag-and-drop method, with the ability, as with all template items, to define all characteristics, including size, font, color, hide/show, etc. Barcodes are included by default on the standard sample/specimen label. 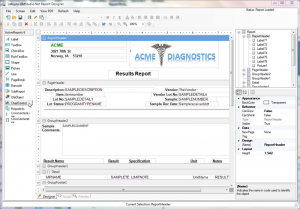 Other standard templates include a results report, bench worksheet, throughput/TAT report and more. Native database tools are also usable on the webLIMS SQL database, including SQL Reporting Services, if desired, as are those for open source apps included in the sciCloud.net® suite. This page was last modified on 31 August 2016, at 19:01. This page has been accessed 25,675 times.